Here is the first post in my “Quilting Q&A” series, where I'll be answering questions from the members of the Quilting Biz community. I'll be answering as many questions as I can, but please be patient. The owner of a beautiful old home (historic register) came to our local quilt guild asking if any of us would be interesting in offering quilts for sale on consignment at the house. I would definitely be interested. Is there a “going rate” percentage for quilt consignors/consignees? I specialize in doll-sized quilts. Can I safely assume that traditional patterns (churn dash, 9-patch, bear paw, etc.) are in the public domain, so I won't get into copyright trouble? What about use of commercial reproduction fabrics — any restrictions on use of repro fabrics in items consigned for sale? OK, we'll take them one at a time. 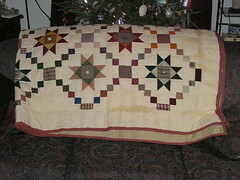 First off, it sounds like a great idea to have some quilts for sale via consignment at an historic house. Quilts – whether traditional or funky – seem to go well with historic houses. They make us think of tradition and family, and they seem like a great way for the owner of the house, who must be doing some tours or some other fun activities around the history of the house, to make a little extra and bring the local quilting community together to help preserve the tradition. If you're going to be giving up 30% to 50% of your selling price to the owner of the house, you'll need to make sure that the remainder (the 50% to 70% of the selling price) is enough to cover all of your material costs and to give you a healthy profit for your time and effort. For example, you might typically sell one of your doll-sized quilts for $50 or $60. If you sell it via consignment, and you give a 50% commission (which is at the high end of the range), then your part of the sale is only $25 or $30. This doesnt' seem like a lot of money when you take into account the cost of materials and labor. The best thing to do is to find out from the owner of the house what she was thinking. In your case, a more reasonable consignment fee might be closer to 25% or 30%, and you should raise your prices a bit to help cover this fee. You always want to make sure your making a healthy profit. And, because this is an historic house, prices should be a little higher since people will not be expecting to find a bargain. They will purchase because they became fell in love with the quilt and the setting the quilt was in when they purchased. Never underestimate the power of place when marketing your quilts. On your question about copyrights and fabrics, it's always best to make sure your designs are either your own, or you are using a design that is clearly in the public domain or one that is designated as usable in for-sale quilts. For the most part, if you are using traditional patterns without using a complete design, you should be OK. But, as I am not an attorney, I cannot say for certain whether a specific pattern or design is copyrighted or not. As far as using reproduction fabrics in your designs, I wrote an earlier article about “Quilting and Copyrights” that is posted on the site. You can find the article by following this link. But again, if there are any doubts, consult an attorney. I am not a lawyer, and don't pretend to know all the intricacies of copyright law. I can only give you the information I have found, and you can make your own determination. I'm not trying to be evasive – it's just that I don't want to get sued! So, I hope this answers LeAnn's questions. If you'd like to have your quilting business questions answered, please use the Contact Form right here on the site. 50% Sounds prohibitive, to be sure! I know %’s are different from area to area. I think the home owner is doing the quilting groups a huge favor…free advertisement, etc. and if the commission is reasonable, they ought to jump on it. We’re always looking for a way to make our ‘hobby’ profitable. I would think that any pattern/fabric that is presented to the public domain is okay to sell..as long as YOU don’t take credit for it as an original. On a personal note: We are in the process of trying to purchase an old home in complete disrepair and restore it…what a great idea to make a few dollars. Any pattern available in a magazine, and not marked as “for private use” and “not to be copied for sale”, or, a pattern from books published for quilters, mainly showing standard, older patterns would be fine to copy. Quilters usually add a little of themselves to a pattern and the pattern is changed. Reproduction fabric has already been copied by the maker. If I purchase fabric I can make anything I want with it. Why worry about fabric? My thoughts, Joan N.
hmm, that is interesting to hear about, as I have been wondering myself about copyright issues for patterns and such. thanks for the great indo, as always!